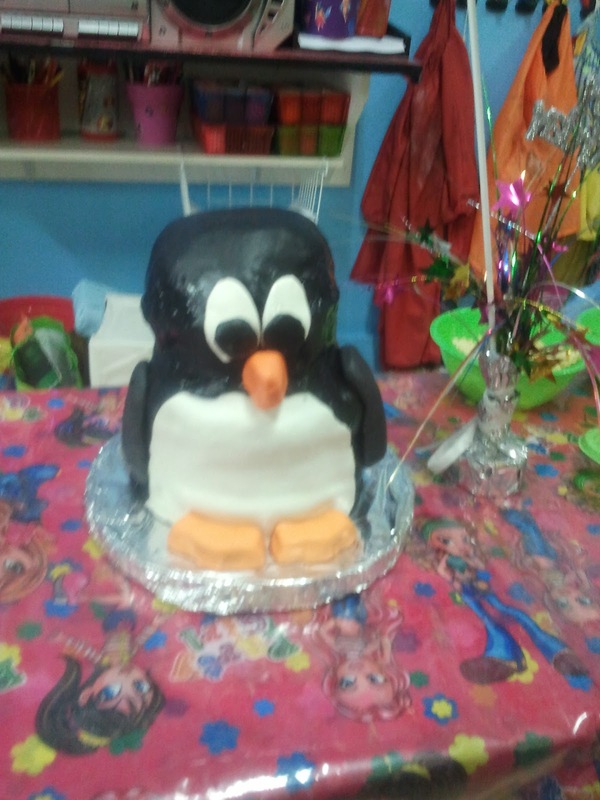 So Darling Son # 1, wanted a Penguin Party. I started by acquiring a penguin biscuit cutter. 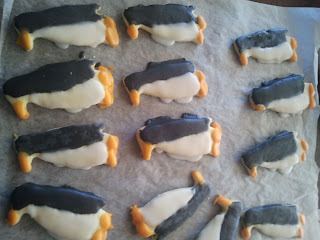 We then baked a basic biscuit recipe and obviously cut them out with the penguin biscuit cutter. I decorated the biscuits in white and black icing. 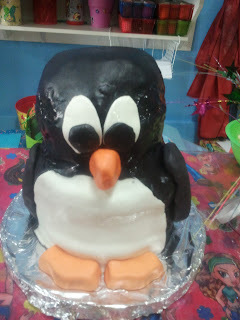 I used CSR Soft Icing Mixture which is gluten free and added water to make a thick paste. I divided the mixture into 3 bowls. I tinted one bowl orange using Queen's food colouring and one bowl black. I then decorated the biscuits using the black and white icing for the bodies and the orange for the beaks. 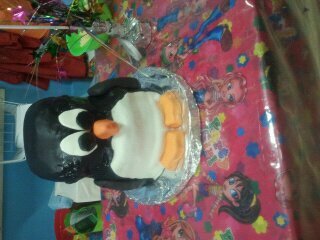 Next I had to make a Penguin Birthday cake. Believe it or not, it is all cake!!! It ended up being about 50cm high. I made a whole lot of round cakes. I used a basic butter cake recipe. I can't remember exactly but think that it was about 5 round cakes. I stacked all the cakes on top of each other and used long wooden skewers to hold the cake together. I put a thin layer of whipped cream and jam between each layer. I then started to shape the head. I used a sharp knife and slowly sliced off the edges of the cake until it looked about the right shape. I then carefully shaped carved out the next area. 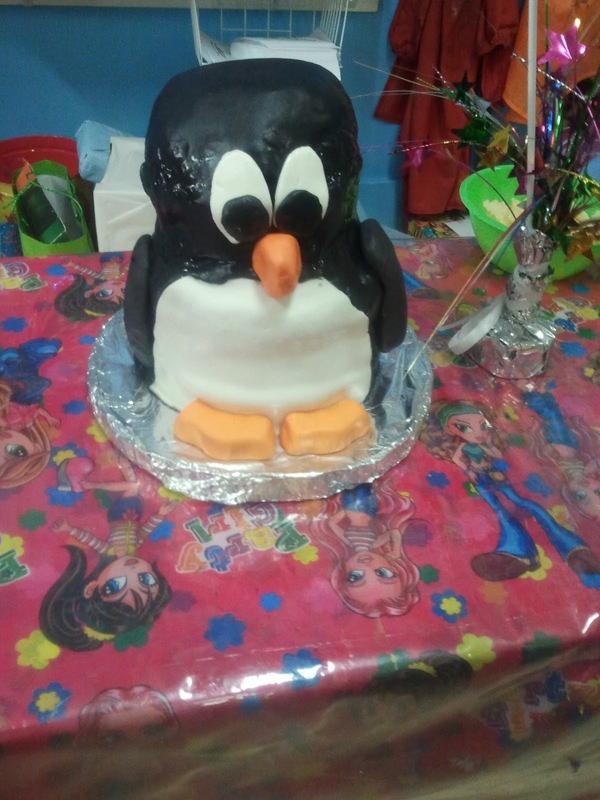 I used Pascall Marshmallows and to make a fondant icing. I always buy the pink and white marshmallows. In a microwave safe container, I placed a small pile of marshmallows and heated them on high for a minute or so. When the marshmallows had melted, I added CSR Soft Icing Mixture. Slowly add the icing mixture to the melted marshmallows and mix to form a dough. When the dough has formed, knead it on a chopping board. I sprinkled the chopping board with the icing mixture. Add the black Queen's food colouring a few drops at a time until the desired colour is achieved. I only melted white marshmallows to use for the penguins tummy. I used the pink marshmallows and tinted it black and orange for the other parts. I heated some jam and spread it over the cake, so that the icing would stick to the cake. Next I rolled out the icing into large sections and draped the icing over the cake. I placed the white tummy on first then the black section. I used some more of the icing to shape the arms, beak, and feet. I used tooth picks to help hold the arms, legs and beak in place.